Hang in There, Kids! (in Mandarin, with English subtitles) is the second feature film by Laha Mebow, director of the two indigenous-directed feature films to be theatre-released in Taiwan. Following the screening, Dr. Darryl Sterk will discuss how the film differs from Avatar (2009, USA) or Atanarjuat (2001, Canada) or other “native features” in that it concerns daily life in a high altitude indigenous village in contemporary Taiwan from the perspective of young people. Dr. Sterk’s talk will share context for how to view Hang in There, Kids! 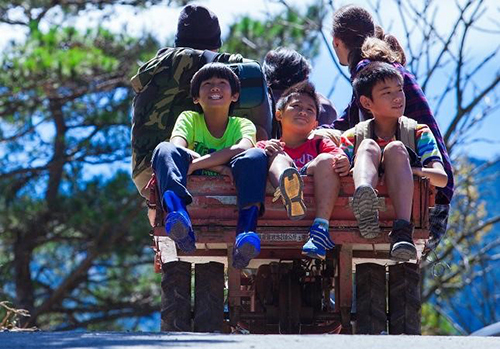 through Taiwanese eyes, arguing that though marketed as “heartwarming,” the film manages to present a relatively accurate picture of Taiwanese indigenous social problems and the existential disappointments they produce. Laha Mebow (Chen Chieh-yao) graduated from the Department of Radio, TV and Film at Shih Hsin University. Trained in scriptwriting and directing, she became the first female Taiwanese aboriginal film director and TV producer. For 18 years, she has devoted herself to film and television production with a focus on aboriginal documentary and drama. Darryl Sterk (Ph.D., Toronto) teaches Chinese-English translation in the Graduate Program in Translation and Interpretation at National Taiwan University. He has studied representations of Taiwan’s indigenous peoples in film and fiction, and is now working on the translation of the Chinese language screenplay for the film Seediq Bale (Wei Te-sheng, 2011) into the Tgdaya and Toda varieties of the Austronesian language Seediq. This event is organized by the UBC Modern Chinese Culture Seminar, hosted by the UBC First Nations House of Learning, and sponsored by the CCK Foundation Inter-University Centre for Sinology, UBC Asian Studies, and the UBC Centre for Chinese Research. UBC is located on the traditional, ancestral, and unceded territory of the Musqueam people.